Queimada is a ritual to ward off evil spirits. It is believed to be an ancient Celtic tradition that has been passed down through the ages. Though some would say that this ‘tradition’ was only established in the 1950’s when Tito Freire designed the clay pot that is now used for this ceremony. Also, the spell that is widely used today was written by Mariano Marcos Abalo in the 1960s and hence adds to the speculation that this is not as old a tradition as you might think. However, many Celtic traditions are oral traditions so would not have been written down and would have had their own localisations to any ritual, adding to the argument that this is an ancient Celtic tradition! Now imagine, it is night time, you have enjoyed a wonderful hearty meal of traditional Galician dishes and are enjoying the crisp night air. The night sky is clear, the stars are bright as is the moon. A cloud slowly covers the moon dipping the night into further darkness. Anticipation can be felt in the air as you gather around. Now is the time for the Queimada. And when this beverage goes down our throats, we will get free of the evil of our soul and of any charm. Forces of air, earth, sea and fire, to you I make this call: if it’s true that you have more power than people, here and now, make the spirits of the friends who are outside, take part with us in this Queimada. As silence falls a lid is put on the clay pot that makes the flames die and closes the connection with the other world! Left behind is a warming drink to be shared among those present for those that are not. 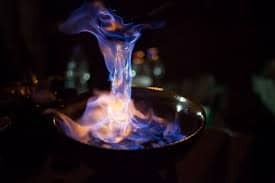 It is claimed that the first sip of the Queimada purifies the soul by banishing out evil spirits, the second sip will cleanse the mind of prejudices, and the third will give rise to passion. So drink with caution! If making this at home be sure to make it in a fireproof bowl and that it is set on a fireproof table. Pour the Orujo into your fireproof bowl and stir in the sugar till dissolved. Then add the coffee beans and lemon rind and stir. Take a deep ladle full of the mixture and carefully set alight before moving the ladle close as possible to the mixture in your fireproof bowl so that it will catch fire. If you want to make this a true Spanish experience you can buy the clay pot and cups online, get in some tapas and make a night of it! In Galicia, this drink is often served at celebrations or family gatherings. Halloween, which is Samain in the Celtic calendar, is a popular time for this drink to be prepared as well as on the night of the 23rd June which is known as ‘Witches Night’ or St John’s Night. So if you are walking the Camino over the 23rd June you might be lucky to experience this tradition. If you have any questions about walking the Camino, the Camino de Santiago tours or our services, then email us at info@followthecamino.com or click on the Contact Us button.